Nissan has turned over a new Leaf. Japan’s second-largest automaker on Wednesday revealed a complete makeover of what was the world’s first mass-market battery-electric vehicle. And with its debut, the 2018 Nissan Leaf becomes the latest BEV to take direct aim at the new Tesla Model 3 — in the process helping transform battery cars from a low-volume niche into what could soon become a major part of the automotive mainstream. Every major automaker, and virtually all second-tier manufacturers, are now working on battery-electric vehicles, driven by a mix of tightening government emissions and mileage mandates, as well as a cross-the-fingers hope that consumers will start to buy in. By 2020, as many as 20 long-range battery-electric vehicles, including the Leaf, are expected to be offered in U.S. showrooms. And that number, by some industry forecasts, could double by the middle of the next decade. It also helps that the latest wave of products, and those now on the drawing board, are beginning to address key EV shortfalls, such as range, price, performance, and charging times. 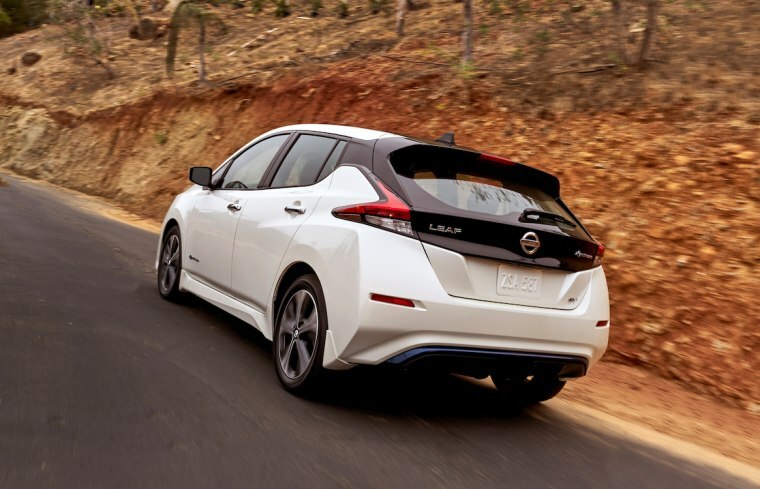 Delivering an estimated 150 miles per charge, the 2018 Nissan Leaf nearly doubles what a buyer of the first-generation battery-electric vehicle could have expected when it launched in 2010. Addressing so-called “range anxiety” is one of the most critical steps in enhancing the appeal of BEVs, said Joe Phillippi, senior analyst at AutoTrends Consulting. The gen-2 Leaf actually falls short of what other recent additions targeting the new battery-car mainstream can manage between charges. The Chevrolet Bolt EV is EPA rated at 238 miles, and while the base car just tops 200 miles, Tesla plans to add a 300-mile optional battery pack for its Model 3. Though the Japanese maker has not confirmed specifics, officials in Japan are indicating that they also will have an optional battery pack on sale next year that would boost range to at least 225 miles. For now, price will be a big plus for Nissan, at just $29,990 for its base Leaf, well below those current competitors. And from that a buyer can subtract $7,500 in federal tax credits and, where applicable, state incentives, as well. The new Leaf adds a number of new tech features, as well, including the semi-autonomous ProPilot Assist system and e-Pedal. Under most conditions, a motorist will be able to drive using just the throttle, even coming to a complete stop on a hill. The 2018 Leaf takes a major detour, meanwhile, when it comes to styling. The original BEV followed the strategy pioneered by the Toyota Prius hybrid, adopting a sci-fi-like design that was meant to help it stand out on the highway. While some manufacturers continue to follow that strategy — notably Honda with its hydrogen-powered Clarity FCV and Hyundai with its electrified Ioniq — most are shifting back to more conventional styling. What matters more, said Nissan’s Mangano, is good packaging. Add easier charging. Since the original Leaf’s 2010 debut, that has become far less of a challenge. There are now thousands of public chargers located around the country, including a growing number of so-called Level 3 systems that can deliver as much as an 80 percent battery top-off in anywhere from 15 to 30 minutes. The option to charge at home is a plus for many BEV buyers since they might never have to worry about a “fill-up” again. They soon might not even need worry about plugging in. When the Mercedes-Benz S550e comes to market later this year it will be able to recharge simply by pulling over an inductive mat, similar to the way some cellphones now charge up wirelessly. Nissan is widely expected to make a similar feature available to the new Leaf at some point during its expected six to eight-year life cycle. “This is definitely coming,” Jesse Schneider, the chairman of a wireless task force put together by the Society of Automotive Engineers, said during an industry event in San Diego last February. The 2018 Leaf also addresses several other concerns about first-generation battery cars. Its battery is smaller and denser than the original car, improving vehicle weight and handling. The motor drive system, meanwhile, makes 37 percent more horsepower and 33 percent more torque — and an even more powerful upgrade is in the works for next year, as well. While early battery-cars had a reputation for being what automotive aficionados might call “stone ponies,” the reality is that there’s a lot of reason for performance fans to like electric propulsion. Unlike gasoline engines that have to rev up, electric motors make maximum tire-spinning torque the moment they are turned on. Consider that the Tesla Model S P100d with optional Ludicrous Mode can match the acceleration of the new, 840 hp Dodge Challenger Demon, both launching from 0-60 in 2.3 seconds. Start-up Lucid Motors is working up a new model, the Lucid Air, that will approach the top-speed of the $2.7 million Bugatti Chiron, already being tested at well over 200 mph. Other performance-oriented brands planning to offer pure EVs include Aston Martin, Lamborghini, Porsche, and Audi. On the mass-market side, expect to see plenty of other automakers try to push into the low-$30,000 bracket. It helps that lithium-ion batteries that cost as much as $1,000 per kilowatt-hour when the original Leaf debuted are now dropping to somewhere between $100 and $150 per kWh. For a vehicle with a 60 kilowatt-hour battery, that adds up to a reduction of as much as $54,000 in factory costs. The first-generation Nissan Leaf has been the world’s best-selling battery-electric vehicle since its debut. It’s unlikely to retain that crown for long: Tesla is forecasting sales of the Model 3 could reach 400,000 next year. For its part, the Japanese maker is looking at a more modest 90,000 Leaf sales annually. But, combined with all the other battery-electric vehicles coming to market, that would go a long way towards transforming the electric niche into a true part of the automotive mainstream.